In early February, the Seidenberg School, led by Jonathan Hill, assistant dean and director of special programs and projects, organized both a software design and gaming workshop and a follow-up weekend-long boot camp in preparation for the upcoming Microsoft Imagine Cup competitions. Twenty students from both NYC and Pleasantville attended. They formed six teams – two in Software Design and four in Gaming. 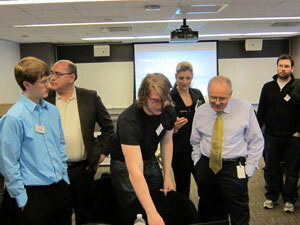 Based on the quality of their ideas, five students were invited to informally present those ideas to Robert Youngjohns, President of Microsoft North America, at the Microsoft Tech Center in Midtown. They were: Jacob Swimmer (BS/CS ’11), Daniel Miede (BS/CS ’11), Andrew Cimino (BS/CS ‘14), Jeremy Pease (BS/CS ‘13), and Allon Hadaya (BS/CS ’14). Competitions in areas including Software Design, Embedded Development, Game Design, Digital Media, and Windows Phone 7 will occur this spring and summer in and around New York City leading to the Worldwide Finals which will also be held in New York City on July 8-13.